1. Remove the glove box (see page 20-174). 2, Disconnect the 4P connector (A) from the power transistor (B), and the 7P connector (C) from the passenger's air mix control motor (D). Remove the self-tapping screws and the passenger's air mix control motor from the heater unit. 3. Install the motor in the reverse order of removal. 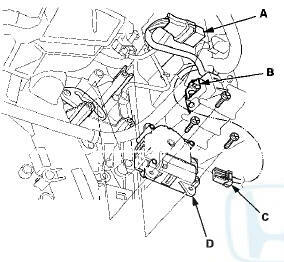 Make sure the pin on the motor is properly engaged with the linkage. After installation, make sure the motor runs smoothly.